Glam Glow Supermud Clearing Treatment This face mask is a worldwide favourite. Its ingredients work to clear up congested skin and it leaves your skin clearer and smoother. Essie Nail Polish in Absolutely Shore Mint green polish is my go-to in Spring or Summer. This shade is lighter than Fiver by Butter London so I like to pair it with glitter polishes for some accent nails. Lush Creamy Candy Bubble Bar* A little bit of this crumbled under running water equals instant bubbles. Like Snow Fairy it is sweetly scented and smells delicious. The best thing about Lush bubble bars is that they last a really long time. Jo Malone Orange Blossom Body Creme, part of a limited edition set last year. This works well to inject some moisture back into dry Winter skin. I love this scent and the fact that it leaves my skin super soft. 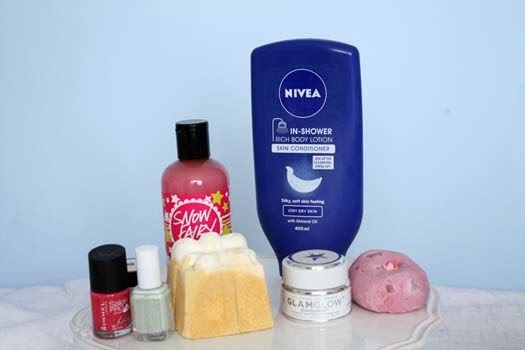 *What are your favourite beauty products to pamper yourself with? You definitely need to get some. It's so good! The Rose Jam one smells divine also. ooo ive got the nivea stuff too! its awesome cause i hate waiting for moisturiser to soak in and normally skip it, but im not all dry legged grossness now haha! I get lazy with body moisturisers too so it's great :).